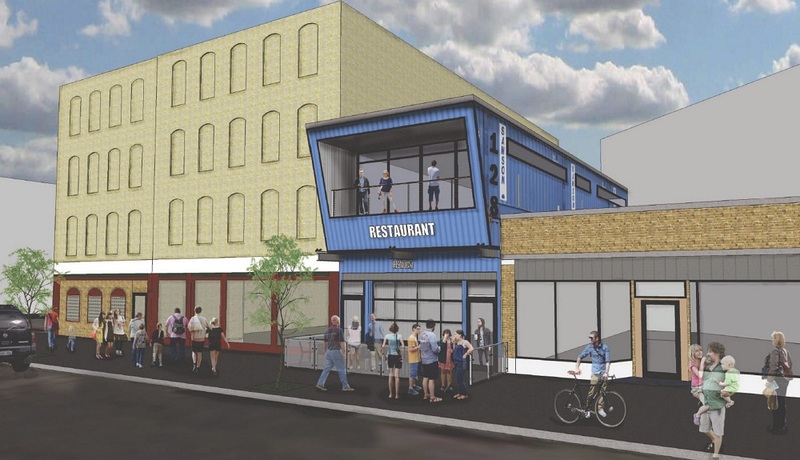 Tasting party for new downtown hot-dog restaurant, the blue building in the plan above, will be Oct. 15. If the name Dog é Style doesn’t exactly scream classy, would a foie gras and duck tubular meat experience anointed with truffle aioli change your mind? That $12 offering headlines the menu at the hot-dog-centric restaurant at 128 Genesee St., which has set an tasting party for Oct. 15, starting at 5 p.m. Eight custom blend hot dogs, made by Wardynski’s, will eventually be available, in addition to Wardynski’s classics, said operator Tom Cowan, who owns the place with landlord Rocco Termini. Besides the foie dog, there’s a Greek dog made with lamb, a ham-based Nola dog topped with fried oysters, and a seafood Salty dog, all between $5-$7. There’s even a veggie No dog, which is largely made of carrots, Cowan said. On Oct. 15, the place will encourage visitors to try complimentary dog samples and hit the cash bar. The regular opening will follow soon after, Cowan said. Opening menu for Dog-E-Style at 128 Genesee St.